The best known and most traditional British eating apple! Self-fertile so may be grown in your garden on its own. 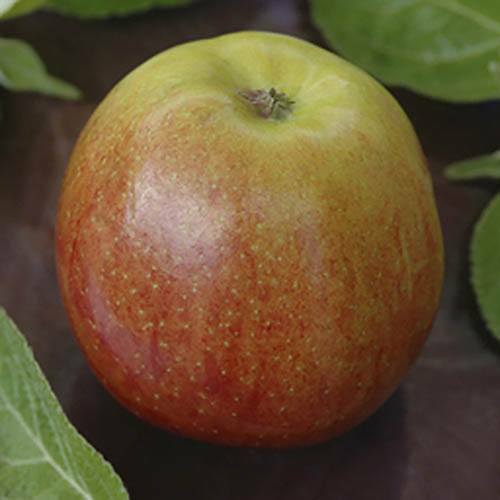 Queen Cox is certainly the best known and most traditional British eating apple and is a Self-Fertile clone of the original 'Coxs Orange Pippin'. This means it needs no other variety to pollinate it, so can be grown alone. The fruits are always crisp when you bite in to them, and are packed with a sweet juice that carries a wonderful sharp, complimentary edge to the flavour. Another really lovely characteristic is the mouth-watering aroma you get with every bite! The attractive rosy red and green skin colour means they look great on the tree as well as in your fruit bowl and when kept chilled but frost free after picking, can be stored for use well into January. They are normally ready to pick in mid-September. 'Queen Cox' is perfectly suited to the UK climate.